What is the Ketogenic way of eating? What is the best method to transition to the Ketogenic way of eating from the Standard American Diet (SAD)? What are these Keto Macros? What foods can I eat on a Ketogenic way of eating? What foods should I avoid on a Ketogenic way of eating? I have been on Keto for X weeks and have only lost X pounds, what am I doing wrong? How do I avoid the "Keto Flu"? I have the "Keto Flu", what do I do? I heard that Keto/LCHF is unsustainable. 1. 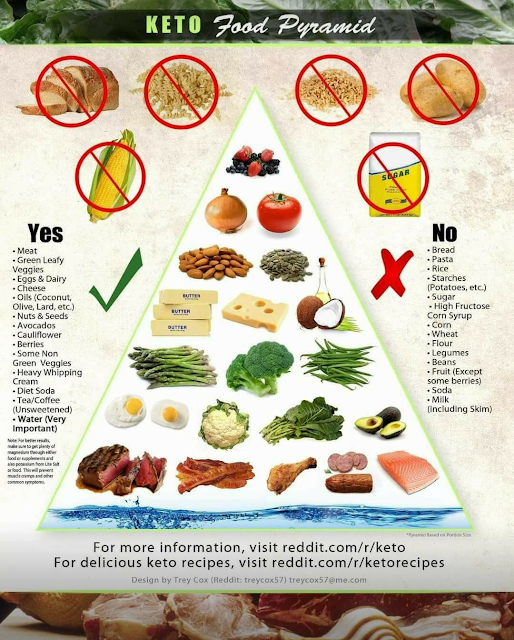 What is the Ketogenic way of eating? The Ketogenic Diet is a high fat, adequate protein, and extremely low-carbohydrate diet that allows the body to enter the metabolic state of Ketosis which results in the liver burning fats for fuel instead of carbohydrates once ALL of the liver glycogen is depleted. Typically, the ratios for these macronutrients is 75% Fat, 20% Protein, and 5% Carbs as a total of your daily calorie intake. We suggest using the methodology of Dr. Eric Westman and limit your carb intake to no more than 20g total, per day. We do not recommend using net carb calculations as not all fibers and sugar alcohols are created equally. In some cases, food companies add items such as soluble corn fiber to try to show that their product has low "net carbs". Dr. Westman's trials have shown that all of his patients enter Ketosis at 20g total carbs, 75% will enter at 30g total carbs and about 50% will enter Ketosis at 50g total carbs. 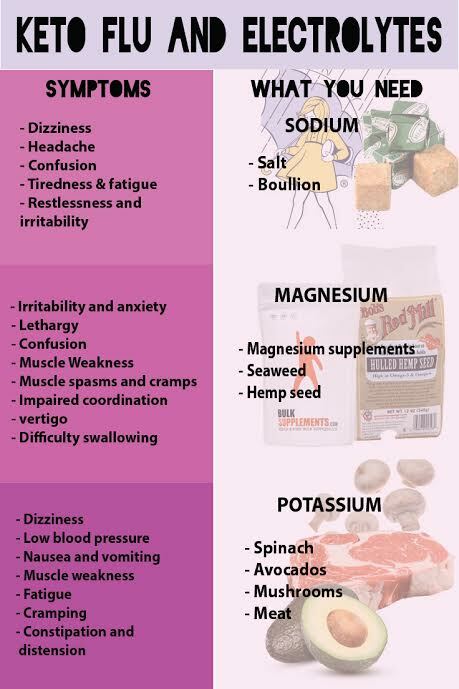 If you are using the Ketogenic Diet for medically necessary reasons, for example, epilepsy, dementia or certain cancers, you should be under medical supervision and strictly adhere to the macros as prescribed by your doctor. If you are on the Ketogenic Diet to lose weight/fat, the most critical macronutrient measure is to keep your total carb intake to <= 20g/day. If you eat plenty of fatty meats and don't exceed the number of calories that your body can burn, you should be in the correct range of the other macros. The goal of the Ketogenic Diet is not actually to get into Ketosis, rather it is to get your body into the mode of burning fats as fuels instead of carbohydrates. Once you are in this mode, your body will more often be in Ketosis. Below is the protocol and food list based on Dr. Eric Westman. 2. What is the best method to transition to the Ketogenic way of eating from the Standard American Diet (SAD)? We created a video that details a transition path, here. Before starting, download an app like My Fitness Pal or Carb Manager and begin recording everything you eat. After you have lowered your daily carb intake to a much lower level, then transition to the Ketogenic Diet. The average person will enter a state of stable Ketosis in about 2 to 7 days, depending on how damaged your metabolism is. Some people may take weeks. The more important question is, how long does it take to burn all of the glycogen out of my liver? This also can vary person to person, but on average, this process takes 5 weeks of continuous, stable Ketosis. If you are a Type 2 Diabetic or have a fatty liver, it may take considerably longer. Keep in mind that this way of eating is first and foremost about healing your metabolism. 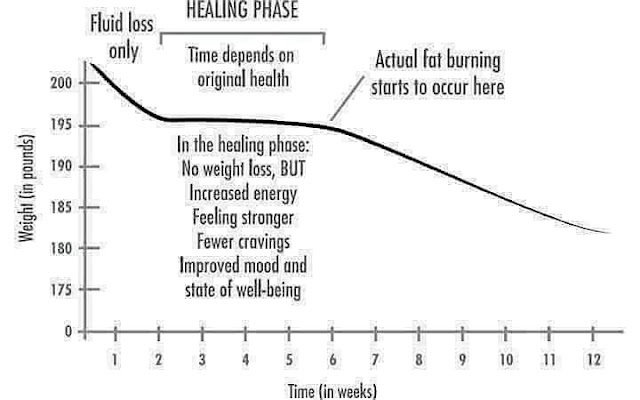 Weight loss is a happy side-effect but generally lags behind healing. There are currently 2 ways to measure if you are in the state of Ketosis. The reason that Ketosis is not the goal is that you can achieve Ketosis outside of the Ketogenic way of eating. A better question would be, How can I tell if I am fat adapted? There are other indications that you are in fat burning/Ketosis mode. You notice that you aren't hungry every 2 hours. 5. What are these Keto Macros? 6. What foods can I eat on a Ketogenic way of eating? My interpretation of the Ketogenic way of eating is to eat REAL FOOD. Be careful with nuts and seeds (macadamias, walnuts, sunflower seeds, etc.) These are calorie dense and easy to overeat. 7. What foods should I avoid on the Ketogenic way of eating? 8. Should I count calories on the Ketogenic way of eating? Be mindful of your calorie intake. Setup your fitness tracker of choice to give you a target calorie range. In the first couple of weeks that you are on Keto, concentrate on keeping your carbs below 20g total every day and maintaining your fats in the 75% range. Do not worry so much about calories. You will need some time to become fat adapted. If you try to limit your calories, you may get frustrated if you stay hungry. Eat fatty meats and vegetables until you are full. Don't eat when you are not hungry. Over time, your appetite will decrease to the point that you rarely exceed your target calories naturally. Depending on your activity level for a given day, your body may require additional or fewer calories. The Ketogenic way of eating is about learning to listen to your body. If you eat real foods instead of processed foods your body will be more able to digest it and communicate with your brain when it is full. 9. I have been on the Keto way of eating for X weeks and I have only lost X pounds. What am I doing wrong? I know that it is tempting to look at all of the Ketogenic way of eating before/after pictures and success stories and wonder why you didn't lose 32 pounds in 2 weeks. The first mistake in any regimen in any lifestyle choice is to compare yourself to others. Not everyone experiences the same results at the same rate. Everyone's biology is unique. A few people experience rapid initial weight loss using the Ketogenic way of eating, but they are not typical. Even the people that have exceptional early success, typically lose water weight in the first few weeks, then the weight loss slows for a period of time. 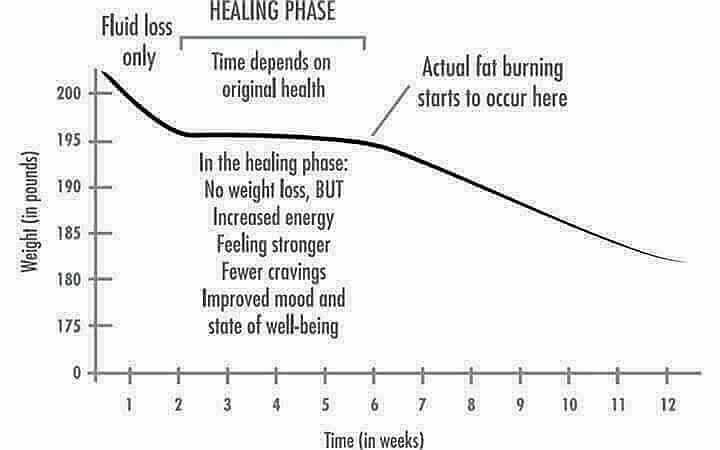 This chart represents the typical weight loss process for most people on the Ketogenic way of eating. People with higher BMI's tend to lose weight faster than people with lower BMI's. However, as a percentage of total weight, they are generally the same. You may not be setting realistic expectations. Under any circumstance, losing 1 pound a week on average should be considered success. That means that a total weight loss for 1 year of 52 pounds would be well above average. 10. How do I avoid the "Keto Flu"? First, you have to understand what the "Keto Flu" really is. Think about the changes that you are making in your lifestyle. Your body (metabolism) is accustomed to easy access to the sugars that you are ingesting in the way of sweets, grains, fruits, sodas, pastries and much more. When those are no longer available, your body has 2 choices. 1. Crash and slow down while waiting for more easy energy or 2. Change modes and begin utilizing fats as fuel instead of sugar. Actually, it isn't a choice, this is what happens. Since you are not accustomed to burning fats for fuel, you do go through a bit of sugar/carb withdrawals. After all, you are totally a carb addict. The carbohydrates and sugars that you were consuming also cause your dopamine levels to rise. Your body produces hormones in an attempt to persuade you to restore those dopamine levels. This has the effect of making you irritable and grumpy and may cause headaches, dizziness, confusion and brain fog. Additionally, carbohydrates have a tendency to cause your body to retain water. Minus the carbs, you now begin to drop water via urine. Along with the urine is exiting salt, potassium, and magnesium. All of these electrolytes are mandatory for your survival and your body begins to show symptoms of nausea, constipation or diarrhea, muscle cramps or soreness. Combined, these are symptoms very similar to influenza. Now that you know what causes it, how can you avoid it? For the carbohydrate withdrawals, the best option might be to step down your carbohydrate consumption over a few days or even a couple of weeks to give your body some time to adapt. However, people do tend to be impatient and want to jump right in. Don't say I didn't warn you. In that case, you are going to have to power through. The loss of electrolytes, on the other hand, are easily handled. Add some salt to your food, drink salt water and try to eat/supplement some additional electrolytes. Finally, stop all cardio exercise until you have become adapted to burning fat for fuel. Crashing during exercise is not pleasant and may actually be dangerous. 11. I have the "Keto Flu". What do I do? First, let's talk about what NOT to do. Some people will advise you to eat a few carbs to handle your carb withdrawals. That would be like telling a person trying to quit smoking to smoke a cigarette to handle their withdrawals. Does that make sense? If you are having a carb crash, this means that your body is starting the fat adaption process. Do you really want to inhibit that process because you aren't feeling 100%? If you are having a carb crash, that is really an energy deficit. 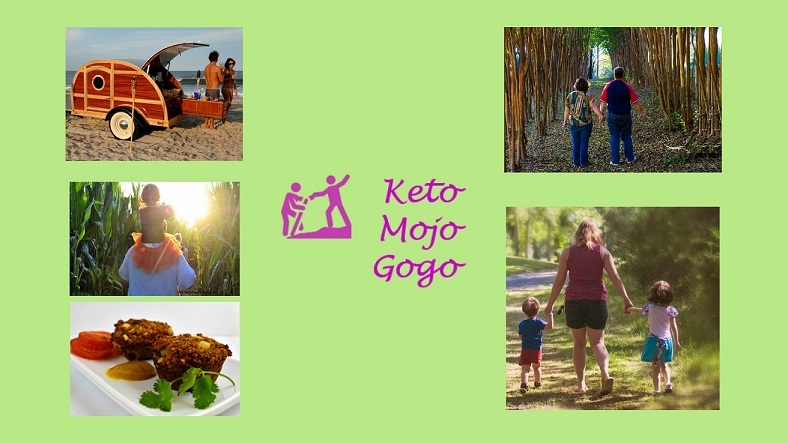 Do you know where you get energy on a Ketogenic way or eating? The answer is from fat. When a person is first starting a Ketogenic diet for fat loss, I recommend upping your fat content in the short term. Dietary fat is easier to convert to Ketones than body fat is. Once you become fat adapted, your body will become more efficient at converting body fat to Ketones. So what is the quickest converting fat to choose? That would be Medium Chain Triglycerides or MCT. Coconut oil contains MCT's, but if you can get some good quality MCT oil that would be better. If you are a coffee drinker, you can blend the MCT oil and heavy whipping cream into your coffee. I also found that this helped masked the aftertaste of artificial sweeteners. Other good sources of dietary fat are avocados, avocado oil, butter, ghee, animal fats like tallow or lard. As you adapt to burning fat for fuel, you should back off on dietary fat so your body fat can be used as fuel, but remember, this is to help you get through the adaption phase. The other symptoms of the "Keto Flu" are due to a shortage of electrolytes in your body. Here is a nice chart that may help you navigate those symptoms. 12. Can I eat too much protein? Can certain proteins be converted to glucose via Gluconeogenesis (GNG)? Yes they can, however, it is not an automatic process. It happens on demand. In other words, when you are not eating tons of carbohydrates and sugars, your body will require your liver to create glucose. Your blood requires 4 grams of glucose at all times. Thus, when required, GNG kicks in to handle the 30% fuel requirements of the brain. The remaining 70% is fueled by Ketones and triglycerides. While it is true that as insulin levels slightly rise in response to the slowly digesting protein, it is busy building lean mass and all of these other tasks. Also, the folks that reside over in the Carnivore tribe of the Keto family eat upwards of 2 pounds of meat every day, yet manage to stay in mile Ketosis. Concerning protein, this is really the 50,000 foot view. I suggest reading Amy Bergers article for more detail.